And at 3 hours long, I definitely benefited from seeing Django Unchained in this luxury. First of all, it didn’t seem “long”, which I find the good lengthy movies rarely do, and it was a visceral and enjoyable experience, though often very disturbing at the same time. First of all — damn, the American South was a horrible, horrible, place! While I know that Quentin Tarantino exaggerates in some ways, he’s not making this stuff up entirely either. I would describe all his movies as “versions of reality”, and they’re not exactly real, but they’re not totally made up, either. The American South was corrupt, violent, extraordinarily racist and hideous in its treatment of most people, but especially of course the African American slave population. Tarantino wanted to create a classic western in this southern story, and I think he succeeded in his typical style. 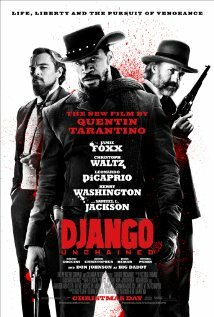 Django (Jamie Foxx) is a strong title character, Leonardo DiCaprio is very convincingly evil and plantation own Calvin Candie, and Samuel L Jackson makes a surprising but largely understated turn as “house slave” Stephen. There’s an amazing assortment of other actors that pop up in various small roles, usually to either comic or horror effect. Really though I think the best performance came from Christoph Waltz as the German bounty hunter Dr. King Shultz. In such a dark world he’s really such a good character, a classic western hero, doing the right thing simply because he thought it was the right thing to do. But he’s also ruthless and violent when he needs to be, but he channels that to the right people. The score works really well, bringing together a mishmash of spaghetti western score, 70s-style funk and modern hip hop at times, again “stylised” is the word that comes to mind, but it’s got a great groove and is a really great and varied listen on its own. The new hip hop from Rick Ross and others is particularly strong and no doubt helped Django reach a younger audience. In the end, it’s a highly stylised version of history, through the lens of 70s exploitation flicks and Tarantino’s own lifetime of film knowledge. You can’t view it as historical in any real sense, even though it obviously has a certain amount of historical basis. Definitely extraordinarily violent at times, but very well done if you’re into this kind of thing.